Many people want to know if drinking while on antibiotics is safe, but the fact is mixing alcohol with antibiotics do not mix. Antibiotics aren’t actually affected by alcohol, that is, their potency isn’t be reduced or increased by it. Rather, the issue with antibiotics and alcohol are the side effects that occur when the two are combined. Being on a course of antibiotics means that there is an infection the body needs to fight, so it’s best to avoid alcohol anyway so the body can heal properly. Signs of a negative reaction to antibiotics or an antibiotic-alcohol combination are flushed face, racing heart, and severe headache. Medical attention should be sought immediately if this happens. Certain antibiotics have an affect on the central nervous system (CNS) causing side effects like sedation, drowsiness, and confusion. Alcohol has the same effect on the CNS so when the two are combined these side effects are worsened. Cycloserine and ethionamide are two antibiotics that could lead to central nervous system toxicity if paired with alcohol. The elderly and those who drive need to be extra cautious if they are consuming alcohol with these particular medications. Erythromycin can have its potency reduced or will take longer to work if alcohol is mixed with it. Some antibiotics should never be taken with alcohol because the mixing of the two is potentially very dangerous. One such medication is Flagyl, which is used for stomach, respiratory, and joint infections. When combined with alcohol, it can lead to something called a “disulfiram-like reaction,” causing stomach cramps, flushing, vomiting, headaches, rapid heart rate, and trouble breathing. Metronidazole and tinidazole are two more antibiotics that should never be taken with alcohol. Once the course of these antibiotics treatments are complete, it’s still a good idea to avoid drinking alcohol for 48 hours after stopping the metronidazole and 72 hours after tinidazole. Even seemingly safe items such as mouthwash or cold medicines should be avoided when taking these antibiotics because of the alcohol content in them. If you are unsure about the side effects that may result from antibiotics and alcohol , discuss it with your doctor; they will be able to tell you of any interactions. You can also ask the pharmacist when you fill the prescription, because it’s their job to know precisely how medications interact with alcohol and other medications. If you are taking an antibiotic longer than the typical course of treatment (seven to 14 days), talk to your doctor or pharmacist which options might be available to you if you want to have a drink occasionally. 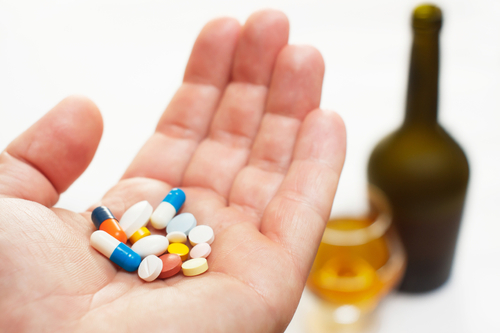 Bottom line: can you drink alcohol while taking an antibiotic, such as amoxicillin? You could, yes, but ultimately, you shouldn’t. http://www.healthline.com/health/antibiotics-alcohol#Overview1, last accessed February 26, 2016.
http://www.nhs.uk/chq/Pages/871.aspx?CategoryID=73, last accessed February 26, 2016.
http://www.drugs.com/article/antibiotics-and-alcohol.html, last accessed February 26, 2016.